THE PULSE: Four Seasons introduces the Extraordinary Experiences collection, giving guests an authentic, exclusive and customizable range of options across the world. Four Seasons continues to set the benchmark in luxury travel with the introduction of a new collection of Extraordinary Experiences exclusive to Four Seasons hotels and resorts. Building on a legacy of delivering memorable, highly customized guest experiences, the collection was conceived with the discerning modern luxury traveller in mind. These immersive, hands-on adventures are as individual as the destinations where they take place. Conceived by each Four Seasons property team, this diverse offering delivers a truly local perspective on an exclusive and customized luxury travel experience. The collection can be viewed online at FourSeasons.com/ExtraordinaryExperiences, where dynamic videos, vignettes and image galleries bring the stories behind each experience to life. Travellers will be able to plan their next holiday by selecting the part of the world they’d like to explore and select Extraordinary Experiences from different categories – from private viewings of some of the world’s most breathtaking art collections to bespoke extreme travel adventures, exclusive five-star dining experiences and everything in between. Over an intimate lunch arranged by Four Seasons Hotel Buenos Aires, legendary Argentinian perfumer Julian Bedel, co-founder of Fueguia 1833, gets to know the individual style and personality of guests before blending carefully selected ingredients that embody one’s unique aromatic identity. A beautifully packaged, one-of-kind signature scent is the result. On a private terrace atop the famed Ponte Vecchio – a Renaissance bridge lined by shops and jewellers spanning the Arno River – guests will linger over a four-course meal designed by Michelin-starred Chef Vito Mollica of Four Seasons Hotel Firenze. The evening also includes a chance to peruse some of the world’s most stunning jewellery, including a stunning "Four Seasons" ring of white gold, diamonds and sapphire by Ponte Vecchio jeweller Dante Cardini. Premium tequila is one of the most coveted beverages in the world, and Four Seasons Resort Punta Mita, México, is giving guests a taste of the blue agave spirit with a one-of-a-kind excursion via private helicopter to the family-run Jose Cuervo distillery in Tequila, Mexico. In addition to a behind-the-scenes tour accompanied by an expert sommelier to demonstrate the tequila making process, guests will feast on a gourmet lunch prepared by a Four Seasons chef, while sipping tequila and listening to live local music. Shoot for the moon, the stars and everything in between during an exclusive stargazing and dining experience available only at Four Seasons Resort Costa Rica at Peninsula Papagayo. Guests can see the southern sky like never before through a powerful GPS-guided telescope while savouring a specially prepared menu of cocktails and culinary treats infused with real meteorite dust. Guests can then capture the moment using a high-tech device that connects a camera to the telescope and go home with a celestial souvenir from a night never to be forgotten. Climbing the world’s great peaks may be on many life lists, but guests can experience this thrilling landscape unlike any other before them with Four Seasons Hotel Tokyo at Marunouchi. Accompanied by a personal guide, chef and butler, guests ascend Mount Fuji on a two day, bespoke and exclusive adventure of a lifetime that includes gourmet meals, hot spring dips, and plenty of time to pause and enjoy the breathtaking views. 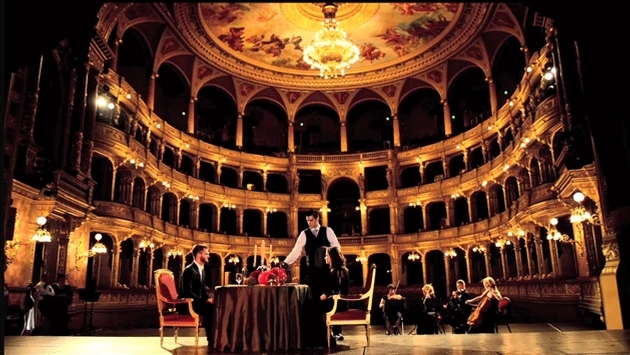 Some may call a private box at the opera followed by a sumptuous dinner the perfect evening – but a small group of guests can now see Don Giovanni in the very theatre where it debuted in 1787, and then savour dinner on the rooftop of Four Seasons Hotel Prague, accompanied by live music performed by members of the Estates Theatre Orchestra under the stars. Many may not have considered pairing opening night at the opera with an all-American tailgate party, but the combination is pure magic when Four Seasons Resort Rancho Encantado Santa Fe makes the arrangements. Beginning with a chauffeured drive to the world-renowned Santa Fe Opera for a behind-the-scenes tour, the evening hits a thrilling high note with a personal tailgate party, where Four Seasons Executive Chef Andrew Cooper serves a gourmet meal against a backdrop of the Sangre de Cristo and Jemez mountains. Boot camp, Texas style begins with a personal consultation with Lucchese, the world-renowned boot maker favoured by celebrities, by special arrangement with Four Seasons Hotel Austin. While the custom boot makers get to work on sewing, shaping and buffing each one-of-a-kind pair, guest will enjoy dining and dancing in true Texas fashion with lunch from Franklin Barbecue - named the top barbecue restaurant in the country - and two-stepping lessons at Austin’s legendary Broken Spoke dance hall.